Memorial Stake — $10.00 ea. 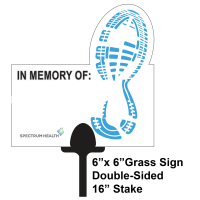 Purchase a 6-inch Memorial Stake that will be displayed in the grassy area surrounding the Bandshell to honor a loved one. Proceeds benefit patients at the Susan P. Wheatlake Regional Cancer Center. Encourgement Stake — $10.00 ea. Purchase a 6-inch Encouragement Stake that will be displayed in the grassy area surrounding the Bandshell to support a loved one. Proceeds benefit patients at the Susan P. Wheatlake Regional Cancer Center. You may also purchase a stake for a nonspecific patient currently undergoing cancer treatment. Just write 'Cancer Warrior' in the field below.